Bring your hair back from the dead. | Bring your HAIR TO LIFE! Has your hair ever appeared like it had no life to it? Nothing you tried would work. Your hair was dull & lifeless, but you knew you needed to do something about it. Well, that comes from lack of attention to your hair. Things like going to bed without wrapping it. You don't even eat healthy, nor exercise. What do you expect, you don't visit the salon for regular upkeep of your hair. Wow, some of you treat your car better than your hair. You have the decency to get the oil changed on that. We'll i'm not trying to be harsh, I just want all of you BEAUTIFUL ladies to have beautiful hair because you deserve it. I'm hear to say, that if you want to keep that hair looking good, you need to invest some time & a little money in it. Now if you like the way you look, that's fine, but still take preventive measures. I remember a time that I was going through stress from "so much to do" with "so little time" to do it, that I neglected my nutritious meals. I always ate out & didn't get those vegetables I needed. Between the stress & unhealthy eating my hair began to shed. I researched & found so much info on the life of the hair. Our hair is fed nutrition & if we don't get it, it will die. 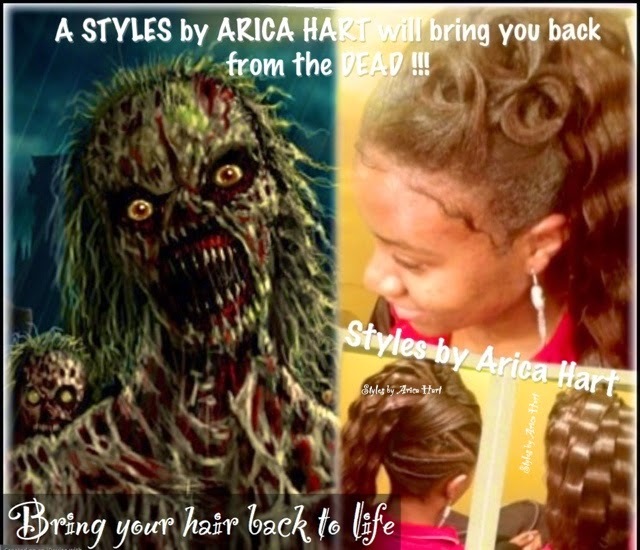 A styles by Arica Hart will bring your hair back from the dead!! You don't want to look like one of the zombies off of the walking dead - do you? You have to much pride in yourself to go out looking like that. I know I don't; therefore, I eat healthier. I also try to work out, and maintain salon quality styling of my hair tresses. I'm going to put it blunt, if your hair look raggedy, so will you. At least keep it clean & neat. Make sure to get your chemical service done professionally so that you want kill the hair with over processing. A lot of people are on the natural kick right now. They wear it beautifully, but I'm saying everything is not for everybody. If you love natural, then wear it. If you love relaxers, then get it- just make sure it's professionally done. If you have already damaged it, then seek a professional to help get you on the right track. Just remember, if you ain't got no hair, I'll put some there. If you need a little moe, I'll make it grow with a styles by Arica Hart . Oh yea, a "styles by Arica Hart" will bring your hair back from the dead!!! Have a blessed & wonderful day !! Is your hair healthy? Has your hair ever seemed like it had no life to it? Do you eat right, or are you one of those "on the go eaters" also? What are some things you do to help keep your hair healthy ? Join the discussion, I'm looking forward to your input. Leave your comments below for a friendly & educational conversation! !.